Exquisite Belgian Damask Pillow Top Design. Tack and Jump Quilting Design. Original Genuine European Vulcanized Latex/Canvas Design True 5 1/2 " full cut depth for exceptional comfort, adjustability, and maximum sleep satisfaction. True, double thick, "I" beam, box-baffle construction - Keeps you "Floating on Air" by reducing pressure points and adding the comfort you need for a great night's sleep. 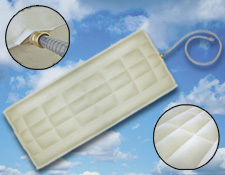 Square-pillow air chamber design - "Pillow" is the key word here; gives you continuous support throughout your entire body. Please Click Here if you would like to see more detailed information about our Air Chambers.